The new Medical Marijuana Regulation and Safety Act consists of three separate bills which were enacted together on Sept 11, 2015 (despite its title, the term “medical cannabis” is used throughout the act). The bill creates a comprehensive state licensing system for the commercial cultivation, manufacture, retail sale, transport, distribution, delivery, and testing of medical cannabis. All licenses must also be approved by local governments. The law will take effect on Jan 1, 2016. After that, the state will need several months (probably at least a year) to set up the necessary agencies, information systems, and regulations to actually begin issuing licenses. In the interim, local governments may choose to adopt new ordinances to permit or license local businesses in preparation for state licensing. Facilities currently operating in accordance with state and local laws may continue to do so until such time as their license applications are approved or denied. In the meantime, prospective applicants are strongly advised to apply to the state Board of Equalization for a Resale Permit, and to prepare for seeking approval from their local governments. AGENCIES AB 266 establishes a new Bureau of Medical Marijuana Regulation under the Department of Consumer Affairs. The Bureau is to establish a comprehensive internet system for keeping track of licensees and reporting the movement of commercial cannabis and cannabis products. (c) Type 1B = Cultivation; Specialty mixed-light. Using exclusively artificial lighting. (e) Type 2A = Cultivation; Indoor. 5001 -10,000 sq ft.
(j) Type 4 = Cultivation; Nursery. (k) Type 6 = Manufacturer 1 for products not using volatile solvents. (l) Type 7 = Manufacturer 2 for products using volatile solvents. CULTIVATION SIZE LIMITATIONS The maximum allowable size is 1 acre (43,560 sq ft) outdoors (Type 3) or 22,000 sq ft indoors (Type 3A and 3B licenses). The DFA is directed to limit the number of Type 3, 3A and 3B licenses. (AB 243, 19332(g)). VERTICAL INTEGRATION There are complicated restrictions to prevent vertical integration (AB 266, 19328). In general, licensees can only hold licenses in up to two separate categories. Small cultivation licensee Types 1 -2 may hold manufacturing or Type 10A retail licenses (limited to three dispensaries). It appears that Types 3-4 licensees can’t apply for manufacturing licenses at all. However, Type 10A licensees can apply for both manufacturing and cultivation licenses, provided their total cultivation area doesn’t exceed 4 acres. Also, facilities in jurisdictions that require or permit cultivation, manufacture and distribution to be integrated as of July 1, 2015 may continue to operate that way until Jan 1, 2026. Type 11 distributors and Type 8 testing facilities can’t hold any other kind of licenses (however, licensees may have their own labs for in-house testing). LOCAL PERMITS REQUIRED No person shall engage in commercial activity without BOTH a state license and a license, permit, or other authorization from their local government. (AB 266, 19320(a); AB 243, 11362.777 (b)). LAWFUL ACTS Actions by licensees that are permitted by both a state license and local government are lawful and protected from arrest, prosecution, or other legal sanctions (AB 266, 19317). GRANDFATHERING Facilities already operating in compliance with local ordinances and other laws on or before Jan 1, 2018 may continue to operate until such time as their license is approved or denied. (AB 266, 19321(c)). Facilities in operation before Jan 1, 2016 shall receive priority. Los Angeles may in any case continue to prosecute violations of Measure D.
APPLICANT QUALIFICATIONS (SB 643, 19322): Applicants must provide proof of local approval and evidence of legal right to occupy proposed location. Applicants shall submit fingerprints for DOJ background check. Cultivation licensees must declare selves “agricultural employers” as defined by Alatore-Zenovich-Dunlap-Berman Agricultural Labor Relations Act. Licensing authority MAY deny application if applicant has been convicted of an offense substantially related to qualifications, including ANY felony controlled substance offense, violent or serious felonies, or felonies involving fraud, deceit or embezzlement, or any sanctions by a local licensing authority in the past 3 years (SB 643, 19323(a)5). FOR-PROFIT ENTITIES are implicitly allowed under the qualifications established above. These were previously “not authorized” under SB 420, but the new licensing provisions extend to individuals, partnerships, corporations, business trusts, etc. (under the definition of “person” in AB266, 19300.5 (aj)). Likewise, applicants no longer need be patients. CULTIVATION LICENSING The DFA shall establish a medical cannabis cultivation program. All cultivation subject to local land use regulations and permits. In cities and counties without cultivation regulations of their own, the state shall be the sole licensing authority as of March 1, 2016 (AB 243, 11362.777 (c)4). TRACK & TRACE PROGAM The DFA shall implement a unique identification program for all marijuana plants at a cultivation site, to be attached at the base of each plant. The information shall be incorporated into a “track and trace” program for each product and transaction. (SB 643, 19335 and AB 243, 11362.777 (e)). Cultivation in violation of these provisions subject to civil penalties up to twice the amount of the license fee, plus applicable criminal penalties. Fines enacted daily for each violation (SB 243, 19360). PATIENT EXEMPTION Qualified patients are exempt from the state permit program if cultivating less than 100 square feet for personal medical use. Primary caregivers with five or fewer patients are allowed up to 500 square feet (AB 243, 11362.777(g) and SB 643, 19319). Exemption under this section does not prevent a local government from further restricting or banning the cultivation, provision, etc. of medical cannabis by individual patients or caregivers in its jurisdiction (AB 243). MANUFACTURERS are to be licensed by DPH. The DPH shall limit the number of Type 7 licenses that produce products using volatile solvents. TESTING (AB 266, 19341-6) The DPH shall ensure that all cannabis is tested prior to delivery to dispensaries or other businesses, and specify how often such testing shall be conducted. *** Confusingly, 19346(c) says the costs of testing are to be paid by cultivators, whereas 19326(c) (3) states that distributors shall charge for the costs of testing; since distributors serve manufacturers as well as cultivators, it doesn’t make sense that testing costs for the former should be charged to the latter. *** Licensees shall use standard methods established by International Organization for Standardization approved by an accrediting body that is signatory to the International Laboratory Accreditation Cooperation Mutual Recognition Arrangement (AB 266, 19342). Licensees shall test for cannabinoids, contaminants, microbiological impurities, and other compounds spelled out in Section 19344. Licensees may conduct tests for individual qualified patients, but not certify them for resale or transfer to other licensees. SCHOOL ZONES Cultivation and dispensary facilities must be at least 600 ft from schools (with grandfathered exceptions specified in HSC 11362.768). (SB 643, 19322 (a) 4). TRANSPORTATION Only licensed transporters can transport cannabis or cannabis products between licensees (AB 266, 19326(a)). 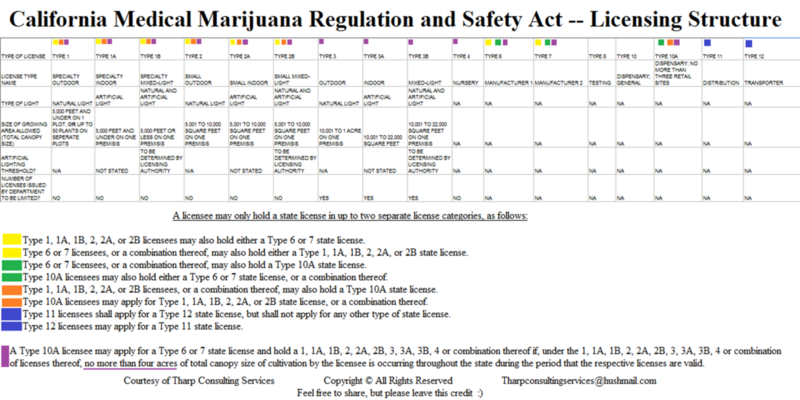 The bill doesn’t specify whether cultivators, manufacturers, or retailers can also have transport licenses, but 19328 (a) states they can generally have at most two separate kinds of licenses. Licensed transporters shall transmit an electronic shipping manifest to the state and carry a physical copy with each shipment (SB643, 19337). PACKAGING Products shall be labeled in tamper-evident packages with warning statements & information specified in Section 19347. PHYSICIAN RECOMMENDATIONS (SB 643): There are several new provisions clarifying the duties of medical cannabis physicians; however, they don’t substantially affect or impair patients’ current access to medical recommendations. • The Med Board’s enforcement priorities are amended to include “Repeated acts of clearly excessive recommending of cannabis for medical purposes,or repeated acts of recommending without a good faith prior exam.” (SB 643, 2220.05). This is identical to existing language regarding controlled substances, which has generally been assumed to apply to MMJ heretofore. • It is unlawful for physicians who recommend to accept, solicit, or offer remuneration to or from a licensed facility in which they or a family member have a financial interest. • The Med Board shall consult with the California Center for Medicinal Cannabis Research in developing medical guidelines for MJ recs. • The recommending person shall be the patient’s “attending physician” as defined in HSC 11362.7(a). Contrary to popular misconception, this in nothing new and in no way limits patients to their primary care physician. It merely restates current language in SB 420. • Physician ads must include a warning notice that MMJ is still a federal Schedule One substance. PESTICIDE STANDARDS shall be promulgated by DFA and Dept of Pesticide Regulation (SB643, 19332). APPELLATIONS OF ORIGIN T.he bureau MAY establish appellations of origin for cannabis grown in California. No product may be marketed as coming from a county where it was not grown. (SB643, 19332.5(b-d)).